Welcome to Used Tire City! If you are looking for used tires you are in the right place! USEDTIRES.NET is located in Kansas City, Missouri. We have both Wholesale and Retail tire options for you. 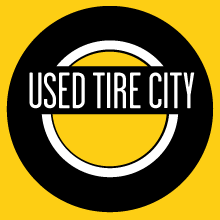 USED TIRE CITY specializes in retail and smaller quantity wholesale orders (1,000 or less.) Feel free to give us a call or you can fill out our form on the Contact Us Page with your information. We will let you know what used tires we have and even give you a price quote. Some of our tires are ALMOST brand new so if you are on a budget and want quality tires, we look forward to hearing from you. I have been coming here for over 10 years; I send everyone that I know there. The guys at the shop are always very quick at getting me in and out. Always fast reliable service that I can trust! I am always amazed at how fast they can get my tires changed here. It’s nothing like going to one of the big chain stores. The tires are of great quality and I know I am getting a great price too! I have been buying containers of tires from them for years now, the quality is great and the prices are very reasonable. I never have problems with the loads received and Chris is very professional, honest, and informative. High Quality with a Warranty!